Well, it’s all about communication. Poor communication can lead to ruined timelines and client relationships and leave a sour-tasting client experience overall. However with great communication you can have your business constantly ticking over in the background all while keeping your clients happy. What’s not to like about that? 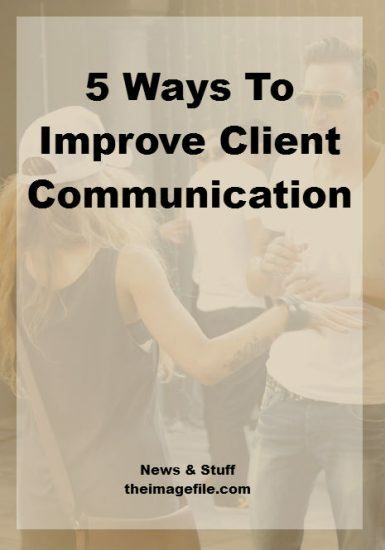 So here are five ways you can improve your client communication and get your clients to deliver their homework on time. Let’s go! Many photographers, especially within the wedding genre, book their clients far in advance. Rather than leave that booking in the darkness of your calendar until D-Day, you can use the months and months beforehand to work on all the questionnaires and workflows you need from your clients. However, even if you aren’t taking bookings too far in advance consider leaving some “buffer space” between taking the booking and the shoot date. Not only will this give you and your client time to prepare all the paperwork and information you both need, but will also create some excitement on the client’s end when the event date finally rolls around. This will boost your client’s experience of your business. Often we are so accustomed to our own process and methods we forget that it’s completely foreign ground to our customers. In order for your customers to respect and follow your process you have to make them understand it. And this is where clear communication can be a game changer. Often what seems incredibly straightforward and obvious to you is totally unfamiliar to your clients, so make sure you go in depth and patiently walk them through each step. Take the time from the start of the project to explain the importance of every step in the process, including client homework, workflows and feedback. This will not only clarify any confusions before the going gets tough, but will also build client trust. Always a good thing! As a child, how many of us ate the broccoli to get to the ice cream? We are all more likely to get stuff done if we have an incentive. The same is true of our clients. Consider ways you can create incentives within your own client process. If you ask your clients to brainstorm their wedding timeline, why not include a coffee shop gift card or a fun notebook? Not only is a little gift unexpected (therefore making you stand out from the crowd), but it also reminds them that you are waiting on their work before you can carry on with yours. We all work a little faster and harder if we know someone is looking over our shoulder. You might also want to set up all your client homework in Google Docs so that your client can make alterations whenever they need – rather than emailing you with every new thought – and you can peek in whenever you get a chance. Plus, if you notice that they are falling behind you can always send them a friendly reminder. A client relationship is very like any other relationship we experience in life. Along with providing reasons for what we do and why we do them, it’s also important to set expectations about what you expect as well as when and why you expect it. This create a fruitful collaboration. Remember that although your business is old hat to you, your clients have probably never worked with someone like you before or if they have, the process may have been very different. So give them timelines and due dates. Tell them when you expect feedback and client homework. Don’t just assume they’ll know. Make it part of your initial meeting plan to not only explain your process to clients, but also explain what you need from them at each step. For example if you offer your clients an engagement session, explain that before that can take place you need them to brainstorm some ideas so that you can make the session unique to them e.g. significant locations, colours, objects, food etc. By stating all of that information from the outset you have covered; what you need, why you need it and when you need it by. No awkwardness required. If you are still having clients respond to you in an untimely manner, then try to explain the importance of each step again and educate them along the way. As many of your clients won’t have worked with you before, they will most likely feel uneasy and unsure about the whole process. They don’t know if what they’re doing is “normal”. So encourage them throughout the event. Reassure them that they’re not bothering you with more details about their wedding timeline and they aren’t the only one that’s struggled to decide between two newborn baby concepts. While your job may be to capture their wedding or create beautiful pictures of their new baby, it’s also a great opportunity to build lasting relationships and make a difference to their day. The way you treat others can be hugely influential to your business in the future. Equally, when you mess up at some point – which you will, it happens to all of us – your clients will be far more likely to give you a break if you’ve been patient and kind to them along the way. Remember that client communication is essentially your responsibility. It’s down to you to make sure that everyone knows what they’re doing and that your client knows that they can always contact you – no matter how silly the question. Take the necessary steps to give the best experience possible. How do you ensure your clients complete homework and send information back on time? What tips have helped you with your client communication?